Benicia Barracks (1849-1898) - Established as the Post near Benicia in 1849 during the California Gold Rush by Captain (Bvt. Lt. Colonel) Silas Casey, 2nd U.S. Infantry and named after the nearby town of Benicia. 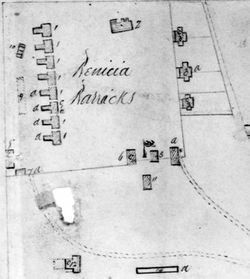 Renamed Benicia Barracks in 1852 by General Order #6, Division of the Pacific. See also Benicia Military Reservation and Benicia Arsenal. Benicia Barracks occupied 99.5 acres in the northwest corner of the Benicia Military Reservation. The post was established as the Post near Benicia on 30 Apr 1849 by Captain (Bvt. Lt. Colonel) Silas Casey and two companies of the 2nd U.S. Infantry, a total of 4 officers and 128 men. The post was the U.S. Army headquarters for the Department of the Pacific from 1851-1857 and was the embarkation point for most troops stationed at Pacific Coast forts up to the U.S. Civil War. During the U.S. Civil War regular U.S. Army troops on the west coast were recalled to the east coast to be at the seat of the war. 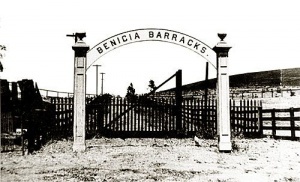 Benicia Barracks was garrisoned by a series of California Volunteer Units who were called upon to garrison the U.S Army posts throughout the west. 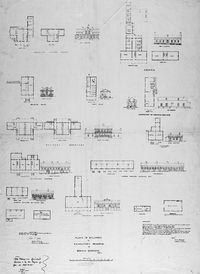 By 1863 Benicia Barracks had evolved into an open plan post with a roughly square parade and a line of eight barracks on the west side. Three sets of married officer's quarters lined the east side of the parade with the bachelor officers quarters on the north side. 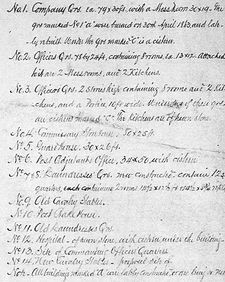 The working buildings lined the south side including the commissary storehouse, the guardhouse, the adjutant's office and the laundress quarters. Further south was the hospital and the stable. At the end of the U.S. Civil War the California Volunteer troops were mustered out and the post was not garrisoned from 18 Dec 1865 to 17 Nov 1866 when elements of the 1st U.S. Cavalry commanded by Bvt. Lt. Colonel Edwin V. Sumner arrived. This page was last modified 19:40, 7 January 2019 by John Stanton. Based on work by Bill Thayer.